The Twelfth Hole is another signature hole on the back 9 and rated as the most difficult on the course. 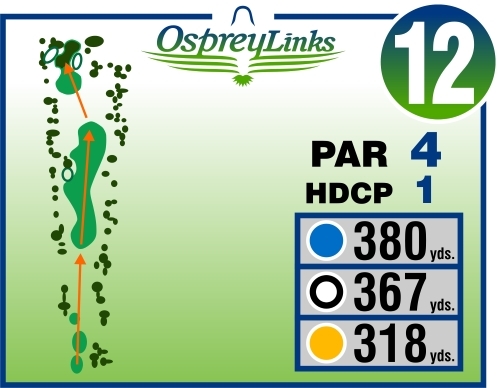 Guarded by woods on both sides of this narrow fairway, leave the driver in the bag and plan to hit a fairway or long iron to the top of the landing zone, ideally 180 yards out. Don’t hit it far enough off the tee and you will have a blind second shot into a narrow green that is 50 yards below you and well guarded by traps. Hit it too far, and you are hitting your second shot from an very uncomfortable downhill lie.